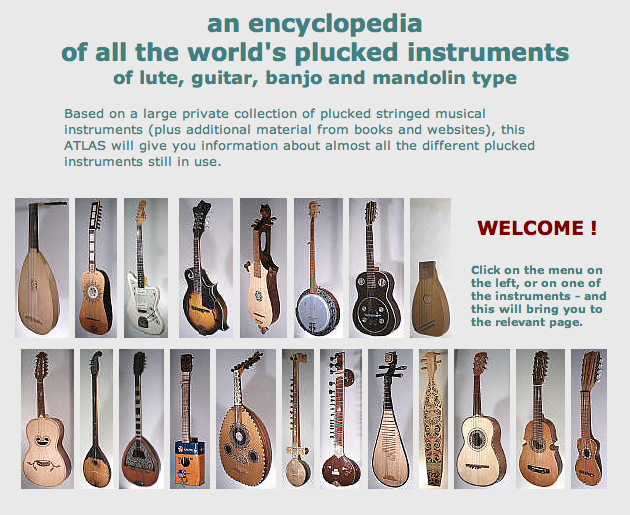 An encyclopedia of all the world’s plucked instruments of lute, guitar, banjo and mandolin type. Plucked string instruments are a subcategory of string instruments that are played by plucking the strings. Plucking is a way of pulling and releasing the string in such as way as to give it an impulse that causes the string to vibrate. Plucking can be done with either a finger or a plectrum. Most plucked string instruments belong to the lute family (such as guitar, bass guitar, mandolin, banjo, balalaika, sitar, pipa, etc. ), which generally consist of a resonating body, and a neck; the strings run along the neck and can be stopped at different pitches. The zither family (including the autoharp, kantele, gusli, kannel, kankles, kokle, koto, gu zheng and many others) does not have a neck, and the strings are stretched across the soundboard. In the harp family (including the lyre), the strings are perpendicular to the soundboard and do not run across it. The harpsichord does not fit any of these categories but is also a plucked string instrument, as its strings are struck with a plectrum when the keys are depressed.